The projects below are a small sample of the hundreds HyettPalma has completed since 1985. If you’d like to learn more about any of these, or talk to us about your Downtown, simply send an email to info@hyettpalma.com. 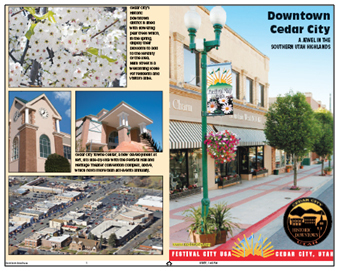 In 1996, after several years of declining business revenues in Downtown Millbrae, the City Council contracted with America Downtown® in hopes of reversing the sales tax decline. 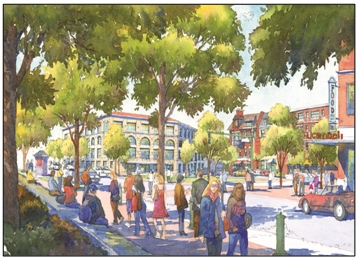 After implementing the five-year Millbrae Downtown Action Agenda recommended by HyettPalma, tax revenue generated Downtown had increased more than 80%. Downtown renaissance is often an ongoing process. With the 2001 announcement that the southernmost station of the BART line would be built in Millbrae, adjacent to Downtown, the Millbrae City Council asked HyettPalma to return and help determine how Downtown could benefit from the new development that would occur around the BART station. As a result of these recommendations, Downtown Millbrae has become a shopping and dining destination – not only for locals, but also for BART-users, and those living in Downtown’s new apartments and staying in Downtown’s new hotels. When a fire destroyed several blocks of Downtown Cedar City, the municipal Redevelopment Agency purchased the property in hopes of attracting a developer. In 1996, after several years without success, the City Council contracted with America Downtown®. Following HyettPalma’s recommendations in the Cedar City Downtown Action Agenda, the City secured a developer who built retail, office, and performance space on the vacant land. In 2011, Cedar City engaged HyettPalma a second time. To build on the success of the first Downtown Action Agenda, the City wanted to create a new Agenda linking Downtown with the local Shakespeare Festival’s expansion plans. Today, Cedar City promotes itself as "Festival City" and its Tony Award-winning Utah Shakespeare Festival is expanding its venues to connect with Downtown. Home of the University of Connecticut, Mansfield does not have a traditional Downtown. Instead, a few small strip centers now fill this role. Unhappy with this situation, the City Council sought assistance from America Downtown®. After conducting an extensive community engagement process, HyettPalma found that the community shared a common vision. "Townies" and students, elected officials and UCONN officials, long-time residents and new, business owners and property owners – all had the same aspirations for their future Downtown: To be the best it could be, for both the present and the future, Downtown Mansfield should be a great place to shop, dine, play, and live, as well as a place where the community comes to stroll, linger, visit, and gather in celebration. On June 29, 2011, the groundbreaking ceremony was held for Mansfield’s new Downtown – named "Storrs Center" in honor of the City’s historic name.